Right now, with Spring Training under way, it is still a matter of seeing who compliments Albert and how he fits in with his team. Of course, the team made moves during the off season, bringing on new talent and letting some player go, and the start of every season involves a readjustment for players, such as Albert Pujols. It took time, in 2012, to figure out where best to situate Albert Pujols in the line up, and that may be something that has to be considered and reviewed during Spring Training all over again. Fans will also be curious to see if Pujols comes out swinging during the Spring Training season. Pujols has 475 home runs and it seems inevitable that he will eventually join the 500-home run club, and many think it might happen as soon as this season. He has an overall batting average of .325. He also has 2,227 hits and 497 doubles. He has 1,425 RBI and an on-base percentage of 1.025. As far as Pujols himself is concerned, he is just hoping that things start off much better than they did in 2012. 2012 did not start very well for him. Perhaps it was just that expectations among the fans and players of the Los Angeles Angels of Anaheim and there was no way he was going to live up to those expectations. However, it seemed like everyone who was not a fan of the Angels was snickering and gloating as Pujols started the 2012 season and immediately began to struggle. Pujols batted .217 and had no homers, but four RBIs, throughout the month of April. There were many fans who were worried that Pujols was having trouble adapting to the American League. Many more just felt that the chemistry between Pujols and his Angels teammates was off. Others wondered if Pujols had already peaked and was now headed down hill. Pujols silenced his critics the very next month. 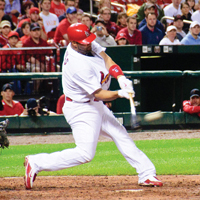 On May 6, in a game against the Toronto Blue Jays, Pujols knocked one into the stands for his first homer of the season. Not just a home run, but a two-hit game-winning shot. That seemed to break the dam that Pujols had erected in his mind and ended the longest home run drought of his career at 139 at-bats. From there, there has been no looking back. Eventually, the Angels made changes that seem to indicate that 2013 should be an amazing year for Pujols and for Angels fans. The team fired their hitting coach, and called up a hot prospect, allowing Pujols to change his slot in the batting order. Since then, his numbers were nothing but up. From May until the All -Star break he batted .323 and had 13 homers. At the end of July he had two home runs in a game against the Rangers. He even won the American League Player of the Week from July 30 to August 5. During that time he was batting .424 and had six homers with 13 RBI. It ended up being a rather dull and boring trip to the post-season for the Angels and for Angels fans. They ended up eliminated rather quickly, far too quickly for most fans. Now, however, with Pujols surviving another post-season without getting injured, and hopefully being rather used to the new team and everything involved, it is hoped that he will be settled and ready for the new season. What does it all mean for Angels fans? Well, it can only mean good things. Any fans of the Cardinals can tell you, Angels fans, that a healthy Albert Pujols means a very exciting season is ahead. Could that mean that, for the Angels, it will be another trip into the post-season? There are already experts who are saying yes.